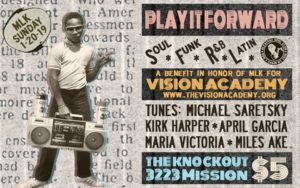 The Knockout: Alcatraz Soul Club – MLK Holiday Sunday Party & Benefit! BENEFIT: We will be honoring Dr. King’s legacy by raising funds for VISION ACADEMY (www.thevisionacademy.org), an after school and summer youth program for children in the Bayview and Mission neighborhoods of San Francisco. Door donation of $5, and all proceeds will go towards this wonderful organization! WHERE: The Knockout (3223 Mission Street), in the Mission/Bernal corrdior. WHEN: Sunday, Jan. 20th. Needle drops at 10:00, stayin’ rowdy til’ 2:00. WHAT: Alcatraz Soul Club is a collective of the Bay Area’s rare soul and funk DJs focused on quality, sophistication and thinking outside the box. The tunes will be killer – feet will move – booties will shake. Your satisfaction is guaranteed!